Lava Rock is, simply, lava turned to stone – it is sometimes used for costume jewellery, or polished and tumbled as a decorative object. Simply put, this is molten volcanic rock, turned to stone – this usually happens when it contacts water. The more proper name for the stone is ‘Basalt’. 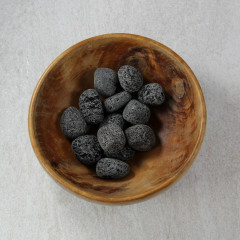 The stone can be used as kitchen counter tops, or for gas fire stones, or for actually cooking on – it is remarkably heat resistant, having been created in a volcano itself. It is sometimes used in jewellery, usually as small beads – and is often sold as tumblestones, which have a speckled appearance that looks almost like the Moon. Basalt is usually grey or black, and contains bubbles and spattered patterns on the surface and inside. They are thought to contain the energy of the volcano in which they were created – and therefore are considered to be an effective healing stone, helping with energy and vitality. It may also contain the energies of fire, heat, and the Earth, and could be used for anything connected to those things.